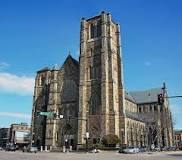 At 364 feet long, ninety feet wide, and 120 feet high, with a seating capacity of 1,700, Holy Cross Cathedral is New England’s largest church. 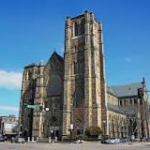 Dedicated in December 1875, it was built of locally quarried Roxbury puddingstone and Quincy granite to designs of noted ecclesiastical architect Patrick C. Keely. The advent of cast-iron construction permitted exceptionally slender nave columns supporting the largest wooden vault of its time. An unfashionably remote location—the former site of the town gallows—betrays Anglo-Saxon Protestant Boston’s ambivalence toward waves of “foreign” immigrants, for whom the new cathedral’s completion after nine years of construction was a signal achievement. 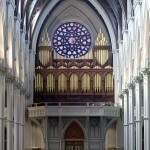 The 1875 Hook & Hastings wasn’t the largest organ built in the United States during the nineteenth century, but at seventy voices and 101 ranks it is the biggest to have survived unscathed. 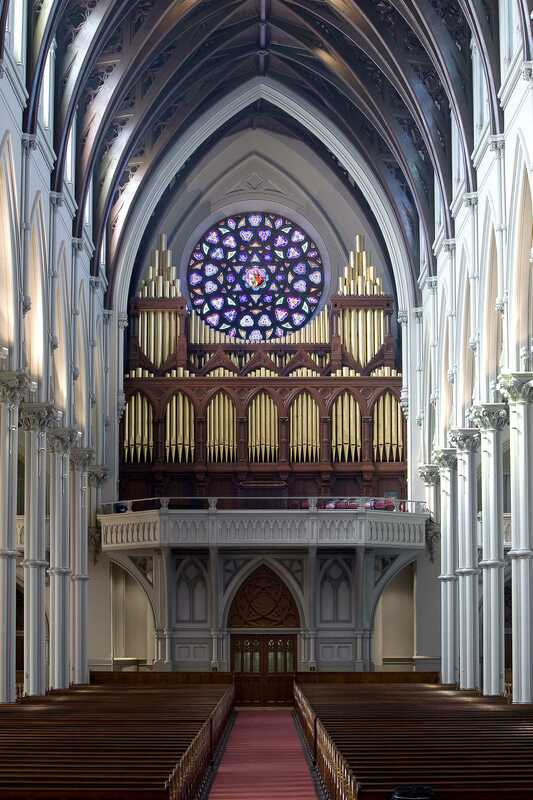 Built in the early years after Francis Hastings assumed control of the firm from founding brothers Elias and George Hook, Holy Cross’s instrument was the first of several organs intended to generate considerable power in vast spaces. Fully a quarter of the organ’s resources—twenty-seven ranks—are vested in a blazing Great chorus topped by a Trumpet and Clarion imported from France. With a five-rank cornet in every department, many registers of pure tin, and a ten-inch pressure Tuba built and voiced in the Hook & Hastings shop, here was Hastings’ manifesto on post-Civil War tonal heroism. Like the neighborhood itself, Opus 801 languished into the twentieth century and into the shadows of newer, “better” organs with electric action and French horns. In the 1920s, the organ was casually electrified and fitted with a second-hand theatre organ console. The Hook revival of the 1960s and ’70s brought renewed attention, however. More recently, under the tireless banner-waving of Cathedral organist Leo Abbott, the instrument is seeing happier days. In 2003, Andover Organ Company supplied a modern console patterned after the original, and in the past decade has undertaken select restoration as funding has become available.